Flavio Briatore has taken over as chairman of Queens Park Rangers' holding company, QPR Holdings Ltd. 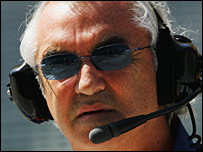 The Italian replaces Alejandro Agag, whose title has been changed to managing director. Briatore owns Rangers along with Bernie Ecclestone and steel tycoon Lakshmi Mittal, whose son-in-law, Amit Bhatia, is now QPR Holdings' vice-chairman. Gianni Paladini remains as the club chairman and will continue to advise the board on football matters. Ali Russell recently left Hearts to take up the role of deputy managing director at Loftus Road. He will work under Agag and is responsible for off-the-pitch matters. Formula One magnates Briatore and Ecclestone agreed a deal to buy QPR last September. Mittal - the world's fifth richest man - later purchased a 20% stake in the west London club.